It's strange to imagine me as the Hoosier in that last headline, but this didn't make me feel any less safe. 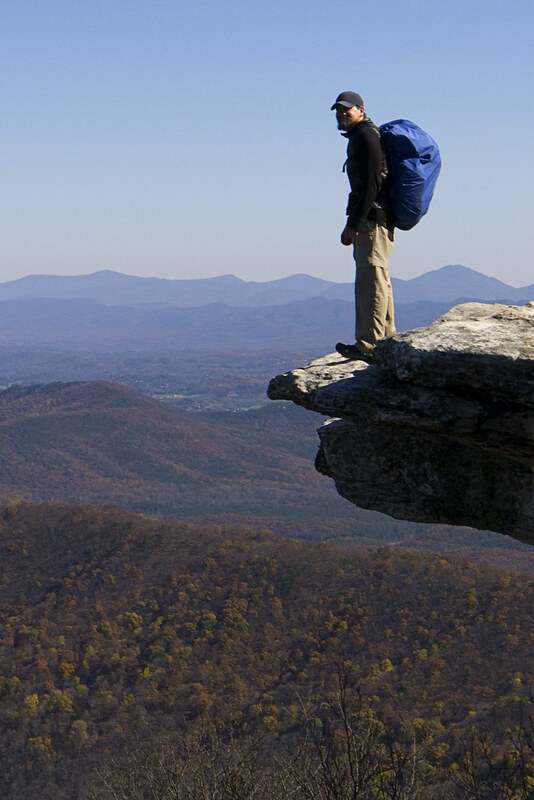 The Appalachian Trail is 2,181 miles long. It covers more square miles than most cities and millions walk on it every year. It would be amazing if nobody ever died on it. Besides, I know the stories that spread the fastest are about the rarest of incidents. Nobody bothers to say, "hey did I ever tell you about that hiker I never met that nothing out of the ordinary ever happened to?" And nobody ever clamored to get the movie rights from that hiker that didn't have to cut off his own arm. “Have you ever heard of Randall Lee Smith?” he said. “Yeah, in the early eighties," he said. "He shot two AT hikers near Pearisburg." “Hmm, I’m two days away from Pearisburg,” I thought. I don't know why he decided to tell this to someone who was thru-hiking. It almost seemed like he wanted to try to scare me or get me to question hiking the trail in the first place. 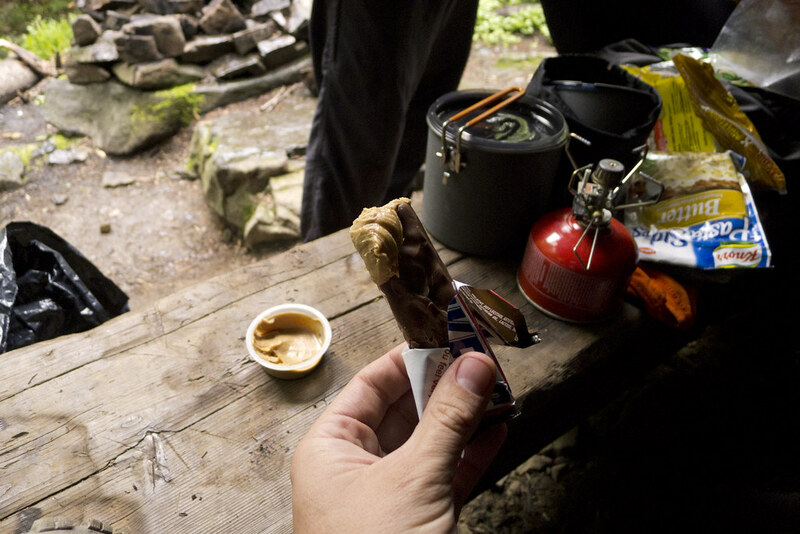 I reached back to grab another one of those Snickers from the side pocket of my backpack. I suppose he was probably just looking out for me, to keep me on guard. I just refuse to believe that a man passing out free candy could have an ounce of menace in his heart. It’s surprising I made it into adulthood. When we were on the trail in Maine, Thumper asked me what my number one fear was. I know I’m not the only one to have some anxiety about the inevitability of death. Unlike many people, however, I’ve never professed to know with any certainty that our consciousness continues after our brains die. Rarely, but on occasion, a thought would enter my mind that what I experience after death will be exactly like what I experienced before I was born. A lot of nothing. That idea could be almost paralyzing if I let it float around my mind for too long. I hadn’t thought about it much while hiking, but somewhere along the trail, the thought of death crept back into my brain. Actually, I remember the exact moment. I was in a shelter near Pearisburg, Virginia. As the year progressed, the days became shorter. This meant more hiking at night to get the needed miles. I decided to stop for the night at one of the many three-walled shelters along the trail. I shined my headlamp inside. It was empty. I did what I normally did when I finished my day at a shelter. Before anything else, I sat down and made dinner. Actually, I typically shoved a honey bun into my mouth and then made dinner. 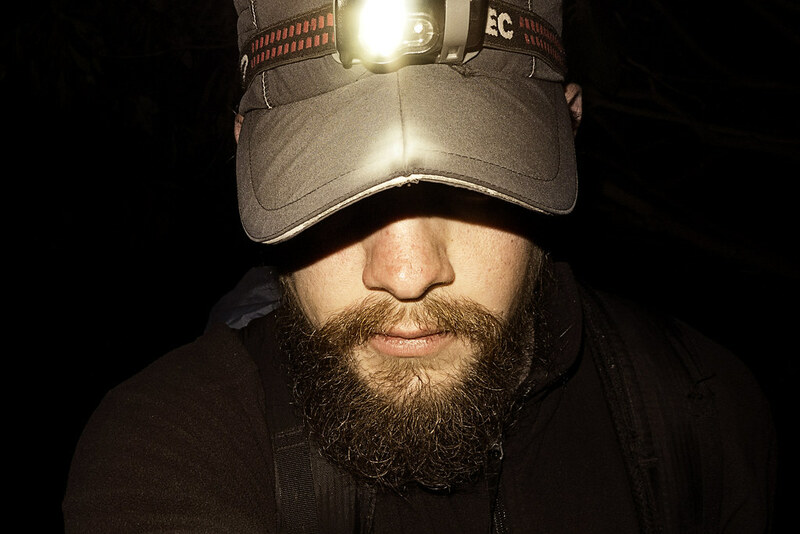 I sat with my feet hanging over the side of the shelter and ate as I stared out at the dark moonlit woods. A flowing stream prevented a total silence. When I finished eating, I hung my food bag above the shelter floor away from rodents. Soon, I was wrapped snug in my sleeping bag and ready for bed. Suddenly, and quite unexpectedly, I saw a yellow glow bob out of the shadowy trees. It was a man wearing a headlamp. There was a rifle in his hands. He walked across the front of the shelter. I tensed up. 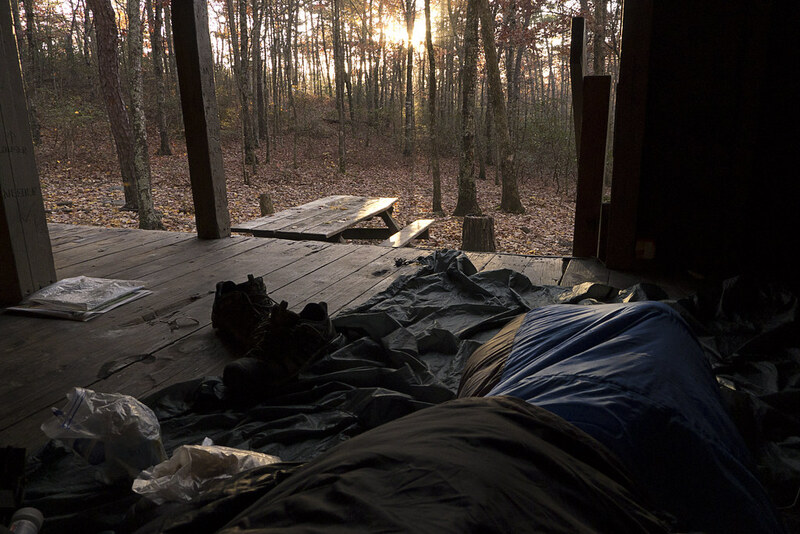 It happened too quickly to do anything, even if I wasn't constrained in my sleeping bag. Neither fight nor flight were options on the table. He turned and looked at me as he passed. His headlamp shined in my eyes. I said, “Hello,” because, you know, there’s no reason to be uncivilized. “How you doin’?” he replied and kept walking. “I’m doing great, thanks, how about you?” I said, trailing off toward the end of my question as he walked out of earshot. It takes slightly longer to rationalize that a man walking down a trail at night with a gun is probably a hunter getting out of the woods late, than it takes to deem him a shotgun brandishing lunatic. I suppose there is some evolutionary survival value in that, so even though it only took a second to assume I wasn’t in danger, a part of me prepared for the worst. What would I have done if he was some kind of Randall Lee Smith copycat heading into the woods near Pearisburg with a shotgun over his shoulder? In that short amount of time, the only thing I could have done is roll back and forth in my sleeping bag like some carnival game duck with a target on its belly. Even if this was a cartoon, there wasn’t even enough time to plug the hole of the shotgun's barrel with my index finger. When he was gone, and I felt safe enough to consider falling asleep, I reflected about death again. I've heard people say there are no atheists in foxholes, but I think you'll find an equal number of completely confident believers in there with them. In the face of death, it wouldn't surprise me if most of the people in foxholes, regardless of their prior beliefs, are suddenly agnostic. I couldn't help but think, what if that man's sudden presence would have been followed by a bang and then dreamless sleep for eternity? Why should it be any different from the unconscious eons before I was born? Perhaps the more interesting question was, why didn't these thoughts freak me out like they have before? Of course, it should go without saying that I don't want to die, but there is a difference between not wanting to die and actually fearing death.While living the free and simple life on the trail, I came to accept this particular inevitability. At least to a point where I don't dwell on it anymore. I thought more about the misnomer "fun-size" than I did about murderers, falls, aneurysms, or bears. And it seemed, the other thru-hikers did as well. I think it's because my fear of death was largely a fear of never living the life I always dreamed of living. I was doing what I loved, I would continue to do what I loved for as long as I can, and que sera sera. So, I've never been able to alleviate the fear of death by convincing myself that there is an afterlife, but does anyone really? I learned, however, that I didn’t need to. I just needed to live this life. And as for my fear of public speaking... yeah, I don't see ever getting over that one.